A Winter’s Tale: The Last Stand of the Decembrists. Tsar Alexander I was dead to begin with, dead since 1 December in fact. 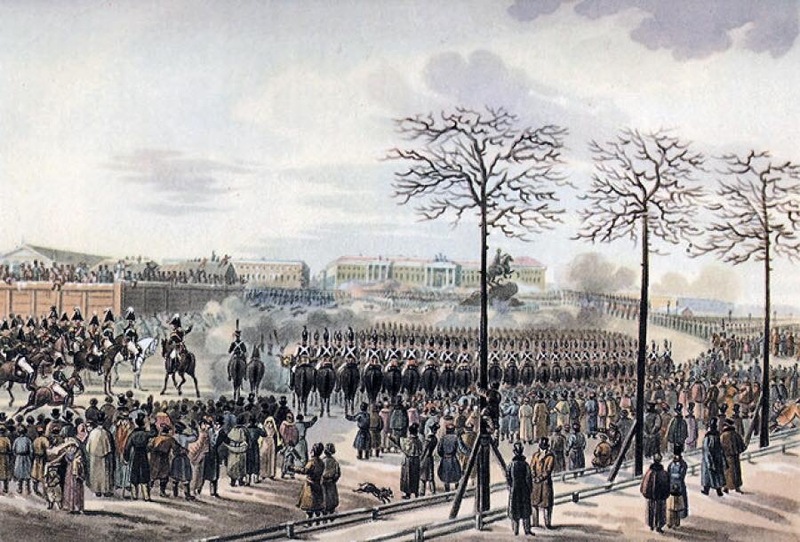 Soldiers of the garrison of St Petersburg and the Imperial Guard had sworn allegiance to his brother Grand Duke Konstantin. However the Grand Duke had never wanted to be Tsar and abdicated in accordance with a secret manifesto signed by the dead emperor that transferred the succession. Into the gap stepped his younger brother Nicholas. Reluctantly at first because he didn’t know about the manifesto and then becasue he wouldn’t accept it. This infuriated, or at least confused a large section of the garrison, and a secret society that would become known as the Decembrists took advantage of it. These were army officers bent on social reform, properly known as the Union of Salvation. 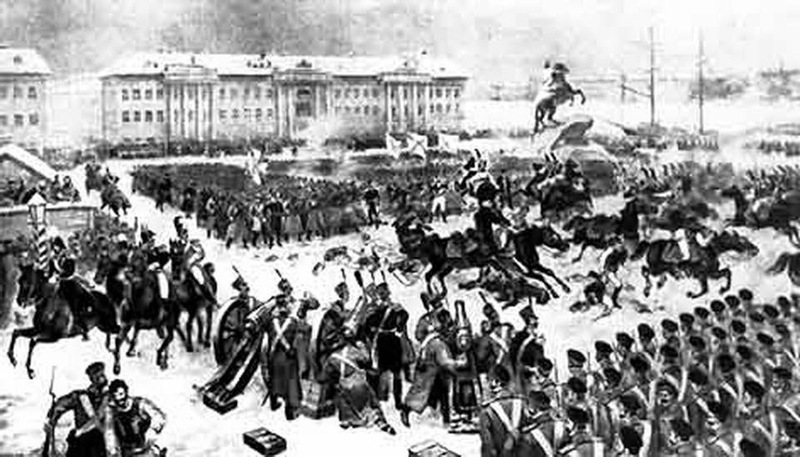 The leaders of the northern part of this movement, liberals who wished constitutional monarchy based somewhat on American lines, were swift to try and persuade the St Petersburg garrison not to swear allegiance to Nicholas, and on 26 December (14 Dec OS), 3,000 mutinous troops, mostly from the Moscow Lifeguard Regiment, Grenadier Lifeguard and Marine Guard battalions marched on Senate Square in the heart of St Petersburg. 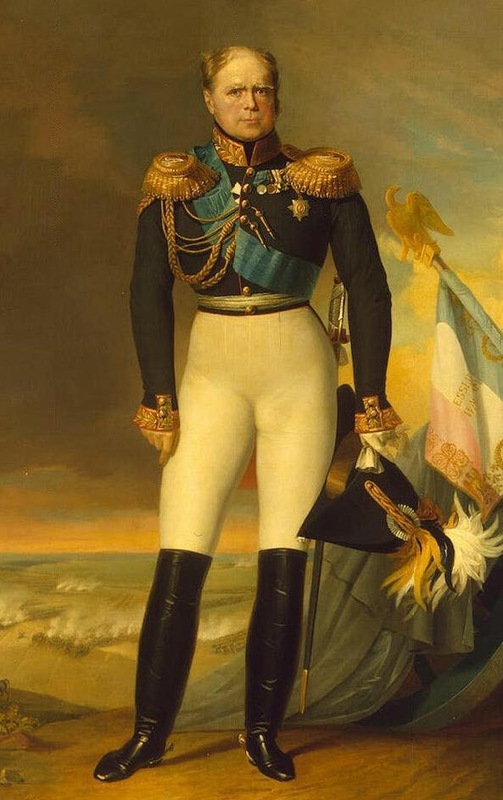 The flamboyant Military governor of the city, General Miloradovich was beside himself and went in a panic to Nicholas, who as yet had been tsar but for a day and whose reign at that moment might not last the night. The emperor told him to get control of his troops. The new Tsar kept his head and was a model of calm and control, telling his family coolly that there was some trouble with the Moscow Regiment and that he would go and see to it. He’d had forewarning that there might be trouble and had called for the freshly sworn in, Imperial Guard to assemble at the Palace Square, and had warned his commanders that morning that they would answer with their heads for the security of the city. The General, a hero of the Patriotic War of 1812, arrived at the scene of the crisis to find the wide expanse of cobblestones occupied by dense formations of infantry. He’d been complacent and reported all quiet that morning and gone to the side of his mistress. He now informed the Tsar not to worry and he would talk to the rebels. Amongst the which were a number of near – fanatical of junior officers that had formed a sub unit from mutinous Grenadiers. The orderly clatter of hooves announced the arrival of the Guard cavalry, who came trooping onto the Square by half squadrons and wheeled rank by rank into line. They formed a resplendent cordon of gleaming horses, white tunics, tall black helmets and burnished armour along the edge of the pave, extending along the edge of the square like unfolding layers of a Russian doll. The loud voices of their officers echoed in the frozen air transforming the public space into a parade ground. Soon the wheels of the artillery were grinding over the slippery cobbles and paving slabs and being wheeled to cover the square. Despite the nascent threat produced by the standoff, curious crowds of had gathered in the avenue mouths and Miloradovich still hoped to diffuse the situation without tragedy. Civilians were moving too and fro from the Decembrist lines as the two sides gave forth in a manifesto bombardment, no cheering met the words of Miloradovich, which dissolved like the steam from his mouth, but every now and the a rebel officer would give forth about the cause and be greeted by cheers of “Konstantine & the Constitution!”. 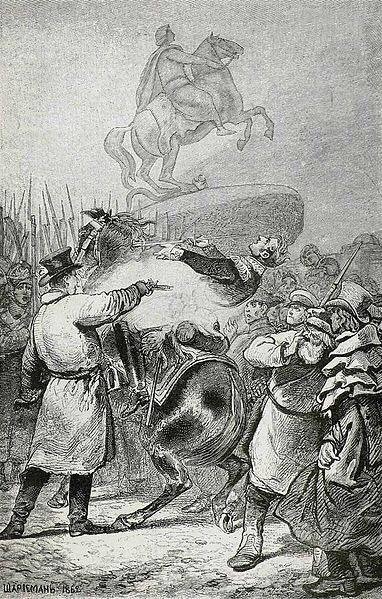 Against the advice of his officers, Miloradovich pressed his horse out from the protective bulwarks of the loyal troops and rode into the open space between them and the rebels. He fearlessly approached the hostile Decembrists, loudly cajoling them to return to their duty. An argument ensued as the rebels warned him to go, for he was endangering his life. Yet before his words could take effect, one of the Decembrist Grenadiers, an officer called Pyotr Kakhovsky, an admirer of Brutus, stepped out from the ranks and levelled his pistol at Miloradovich’s back. The sound of the shot echoed around the square as an audible declaration of intent and shattering the illusion of a field day, it silenced the General’s calls for surrender and went to the heart of all watching. A shocked groan arose from the watching crowd, a murmur of anger and dismay from the loyal troops as the General slumped in his saddle and slipped to the ground. As he lay helpless his staff moved to rescue him but before they could, Yevgeny Obolensky darted forward and bayoneted the General before his horrified aides could drag him to safety. Miloradovich shot down beneath the gaze of Peter the Great. Brutus killed Caesar at the foot of a statue of Pompey the Great. There was now little hope for a peaceful resolution. Karkhovsky shot down another negotiator. The Metropolitan Serafim and Grand Duke Mikhail Pavlovich were turned away for fear of meeting the same fate. The time for talk had passed. 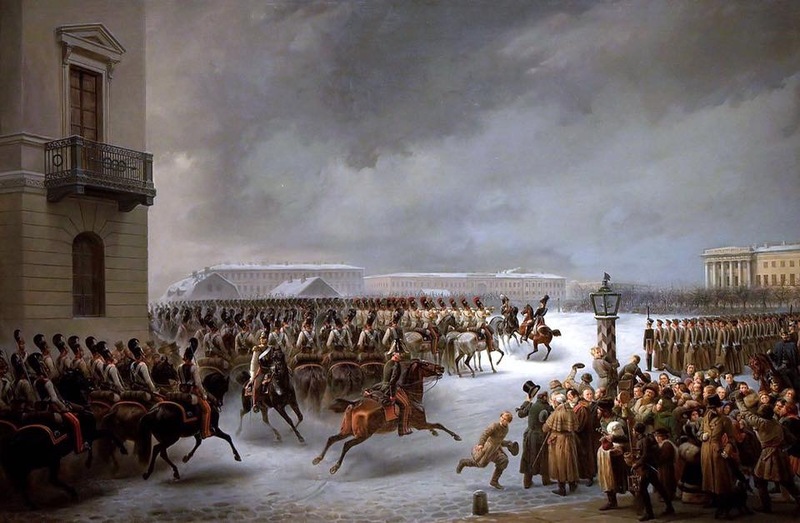 An attempt by the Grenadiers to seize the winter palace was foiled by the Lifeguard Sapper Regiment under their commander, Alexander Gerua. Tsar Nicholas, who had by now arrived on the scene at the head of impeccably disciplined attack columns of the Preobrazhensky Life Guard, curtly ordered General Orlov to lead the cavalry to the charge. 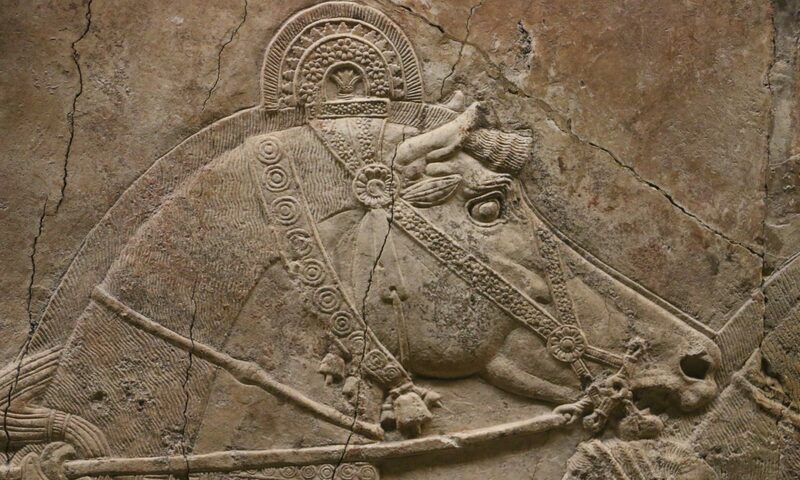 The trumpets blared, gleaming sabres were unsheathed to the light and voices rose in anger, but the hooves of the Guard cavalry slipped on the frozen cobbles of the square. The rebels let off a volley and they retired in disorder. The Decembrists had stayed resolute but the respite was temporary. For they had suffered high – up defections even before they had made their move, they had no strong leader to speak for them and the loyal troops such as the Preobrazhensky and Semonovsky Lifeguards were not switching sides as expected. What had begun as a triumph of will was fast taking on the characteristics of a doomed last stand and Nicholas was urged by his aides to use the artillery. “Yes sire,” affirmed Prince Vasilchikov coldly “to save your empire.” Hard words indeed for an absolute ruler to ignore. An echoing order unlimbered the waiting artillery, and reached the ears of embattled rebels waiting in the middle of the square, more ringing summonses saw them loaded and primed. Seeing the shining barrels pointed towards them, some Decembrists urged an attack to put them out of action. Yet for some reason no one thought their Tsarist comrades would really open fire. Guns and Blows must decide. They were mistaken, a further warning rang out and was ignored. The tsar gave the nod. The three Romanov brothers were martinets and loved parade ground nicety, the end would come brutally but with proper military procedure. Nicholas had even been so exact as to direct a group of rebel Grenadiers to their posts and to mind their dressing. He said at last “Guns to fire in order from the right flank!” A pause while the order was transmitted, and then another echoing command; “Fire!”. Under the pale winter’s sky, as hard and uncaring as ice, the gunners of the St Petersburg garrison lit their touch-holes and cleared Senate Square case. The tense silence of the standoff was shattered with noise of the discharges, giving way to the cries and shrieks of the wounded and dying, the echoes of which would take long to fade. Anointed in blood. Tsar Nicholas. In the days that followed the ringleaders were plucked from the carnage of the wrecked movement. 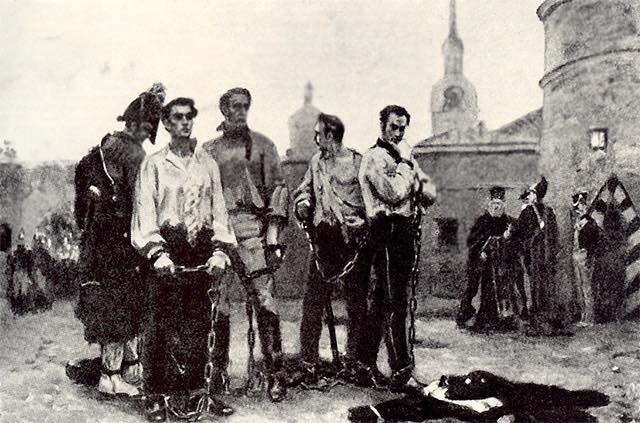 The Southern society in Ukraine was crushed and over 300 were sent to prison or Siberia, the 5 chief plotters were condemned to death by hanging. On the allotted day, that summer, at least 3 of the wet ropes on the scaffold snapped before death had taken their allotted burdens. So our winter’s tale ends, a tale as cold as the name of its principle protagonists, yet heated by the fires of revolution. 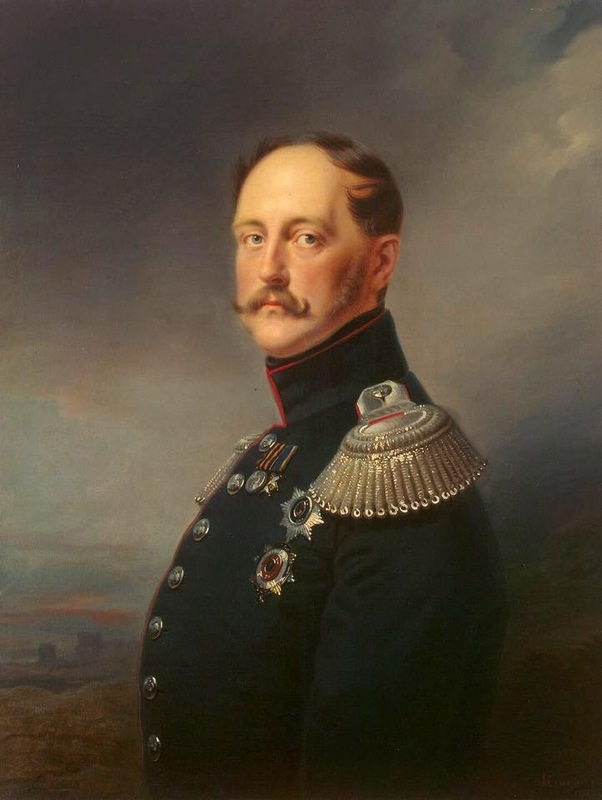 Tsar Nicholas I succeeded as Tsar, anointed with the blood of the Decembrists, which served as a purifying ointment on the alter of absolute rule. The Romanov’s: Simon Sebag Montefiore. 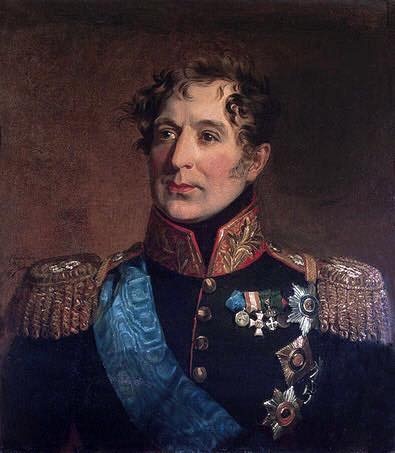 Russian Officer class of the Revolutionary and Napoleonic Wars: Alexander Mikaberidze. Pushkin’s Ode to Liberty. M. A. Duvemet. Europe 1780-1830 By Franklin L. Ford. Previous PostPrevious Book Review: The House of Beaufort by Nathen Amin. Next PostNext Chaz Mena’s Adventures in Historyland.